*The Holy Father exhorts priests to make use of this exorcism as often as possible. It is therefore worthy of propagation. The faithful also may say it as any approved prayer. In the Name of the Father and of the Son and of the Holy Ghost, Amen. Let God arise and let His enemies be scattered: and let them that hate Him flee from before His Face! As smoke vanisheth, so let them vanish away: as wax melteth before the fire, so let the wicked perish at the Presence of God (Ps 67:1-2). Judge Thou, O' Lord, them that wrong me: overthrow them that fight against me. Let them be confounded and ashamed that seek after my soul. Let them be turned back and be confounded that devise evil against me. Let them become as dust before the wind: and let the Angel of the Lord straighten them. Let their way become dark and slippery: and let the Angel of the Lord pursue them. For without cause they have hidden their net for me unto destruction: without cause they have upbraided my soul. Let the snare which he knoweth not, come upon him: and let the net which he hath hidden, catch him: and into that very snare let him fall. But my soul shall rejoice in the Lord, and shall be delighted in His Salvation (Ps 34:1, 4-9). Glory be to the Father, and to the Son, and to the Holy Ghost, as it was in the beginning, is now and ever shall be, world without end, Amen. 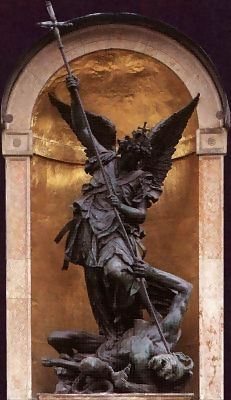 O' Most Glorious Prince of the Heavenly Armies, St. Michael the Archangel, defend us in the battle and in our wrestling against principalities and powers against the rulers of the world of this darkness, against the spirits of wickedness in the high places (Ephes 6:12). Come to the aid of men, whom God created incorruptible, and to the Image of His own Likeness He made him (Wis 2:23); and from the tyranny of the devil He bought him at a great price (Cor 7:23). Fight the battles of the Lord today with the Army of the Blessed Angels, as once thou didst fight against lucifer, the leader of pride, and his apostate angels; and they prevailed not: neither was their place found anymore in Heaven. But that great dragon was cast out, the old serpent, who is called the devil and satan, who seduceth the whole world. And he was cast unto the earth, and his angels were thrown down with him (Apoc 12:8-9). Behold, the ancient enemy and murderer strongly raises his head! Transformed into an angel of light, with the entire horde of wicked spirits he goes about everywhere and takes possession of the earth, so that therein he may blot out the Name of God and of His Christ and steal away, afflict and ruin into everlasting destruction the souls destined for a Crown of Eternal Glory. On men depraved in mind and corrupt in heart the wicked dragon pours out like a most foul river, the poison of his villany, a spirit of lying, impiety and blasphemy; and the deadly breath of lust and of all iniquities and vices. Her most crafty enemies have engulfed the Church, the Spouse of the Immaculate Lamb, with sorrows, they have drenched her with wormwood; on all her desirable things they have laid their wicked hands. Where the See of the Blessed Peter and the Chair of Truth have been set up for the light of the gentiles, there they have placed the throne of the abomination of their wickedness, so that, the Pastor having been struck, they may also be able to scatter the flock. Therefore, O' thou unconquerable Leader, be present with the people of God and against the spiritual wickedness which are bursting in upon them; and bring them the victory. The Holy Church venerates thee as its Guardian and Patron; and it glories in the fact that thou art its Defender against the wicked powers of earth and hell. To thee the Lord has assigned the souls of the redeemed to be placed in Heavenly bliss. Beseech the God of Peace to crush satan under our feet, that he may no more be able to hold men captive and to harm the Church. Offer our prayers in the sight of the Most High, so that the mercies of the Lord may quickly come to our aid, that thou mayest seize the dragon, the ancient serpent, who is the devil and satan and that having bound him, thou mayest cast him into the bottomless pit, so that he may no more seduce the nations (Apoc 20:3). Hence confiding in thy protection and guardianship, by the sacred authority of our ministry, we confidently and securely begin the task in the Name of Jesus Christ our God and Lord, of driving away the attacks of diabolical deceit. Behold the Cross of the Lord, flee away ye hostile forces. May Thy mercy, O' Lord, be upon us. All: Since we have hoped in Thee. O' Lord, hear my prayer. All: And with thy spirit. O' God and Father of Our Lord Jesus Christ, we invoke Thy Holy Name, and we humbly implore Thy mercy, that by the intercession of the Mother of God Mary Immaculate Ever Virgin, of Blessed Michael the Archangel, of Blessed Joseph the Spouse of the same Blessed Virgin, of the Blessed Apostles Peter and Paul and of all the Saints, Thou wouldst deign to afford us help against satan and all the other unclean spirits and against whatever wanders throughout the world to do harm to the human race and to ruin souls, through the same Christ Our Lord, Amen. We exorcize thee, O' every unclean spirit, satanic power, infernal invader, wicked legion, assembly and sect; in the Name and by the power of Our Lord Jesus Christ (+); may thou be snatched away and driven from the Church of God and from the souls made to the Image and Likeness of God and redeemed by the Precious Blood of the Divine Lamb (+). Most cunning serpent, thou shalt no more dare to deceive the human race, persecute the Church, torment God's elect and sift them as wheat (+). The Most High God commands thee (+). He with whom in your great insolence, thou still claimest to be equal; He who wants all men to be saved and to come to the knowledge of the Truth (1 Tim 2:4). God the Father commands thee (+), God the Son commands thee (+), God the Holy Ghost commands thee (+). The Majesty of Christ, the Eternal Word of God made flesh, commands thee (+); He Who to save our race outdone through thy envy, "humbled himself, becoming obedient even unto death" (Phil 2:8). He who has built His Church on the firm rock and declared that the gates of hell shall never prevail against Her, because He will dwell with Her "all days even to the end of the world" (Mat 28:20). The Sacred Sign of the Cross commands thee (+), as does also the power of the Mysteries of the Christian Faith (+), the Glorious Mother of God, the Virgin Mary, commands thee (+); She who by Her humility and from the first moment of Her Immaculate Conception, crushed thy proud head. The faith of the Holy Apostles Peter and Paul and of the other Apostles command thee (+). The Blood of the Martyrs and the pious intercession of all the Saints command thee (+). Thus, cursed dragon and thee diabolical legion, we adjure thee by the Living God (+), by the True God (+), by the Holy God (+), by the God "who so loved the world that He gave up His Only Son, that every soul believing in Him might not perish but have life everlasting" (John 17:1-3); stop deceiving human creatures and pouring out to them the poison of eternal damnation; stop harming the Church and ensnaring her liberty. Begone, satan, inventor and master of all deceit, enemy of man's salvation. Give place to Christ in whom thou hast found none of your works; give place to the One, Holy, Catholic and Apostolic Church acquired by Christ at the price of His Blood. Stoop beneath the powerful Hand of God; tremble and flee when we invoke the Holy and terrible Name of Jesus, this Name which cause hell to tremble, this Name to which the Virtues, Powers and Dominations of Heaven are humbly submissive, this Name which the Cherubim and Seraphim praise unceasingly repeating: Holy, Holy, Holy is the Lord, the God of Armies! God of Heaven, God of Earth, God of Angels, God of Archangels, God of Patriarchs, God of Prophets, God of Apostles, God of Martyrs, God of Confessors, God of Virgins, God Who has power to give life after death and rest after work, because there is no other God than Thee and there can be no other, for Thou art the Creator of all things, visible and invisible, of whose Reign there shall be no end. We humbly prostrate ourselves before Thy Glorious Majesty and we beseech Thee to deliver us by Thy Power from all the tyranny of the infernal spirits, from their snares, their lies and their furious wickedness; deign, O' Lord, to grant us Thy powerful protection and to keep us safe and sound. We beseech Thee through Jesus Christ Our Lord, Amen. All: Deliver us O' Lord. All: We beseech Thee, hear us. St. Michael the Archangel, defend us in the day of battle; be our safeguard against the wickedness and snares of the devil. May God rebuke him, we humbly pray and do thou, O' Prince of the Heavenly Host, by the Power of God, cast into hell satan and all the other evil spirits, who prowl throughout the world, seeking the ruin of souls, Amen.